Carbohydrates are composed of carbon, hydrogen, and oxygen atoms linked together to form monomers called simple sugars or monosaccharides (mono = single; saccharine = sweet, sugar). Carbohydrates play a number of roles in living things. They are an immediate source of energy (sugars), provide shape to certain cells (cellulose in plant cell walls), and are the components of many antibiotics and coenzymes. They are also an essential part of the nucleic acids, DNA and RNA. The ability to taste sweetness is a genetic trait. Geneticists have found two forms of a gene that are known to encode for the sweet taste receptors, and people whose ancestors are from Europe have the keenest sensitivity to sweets. The empirical formula for a simple sugar is easy to recognize, because there are equal numbers of carbons and oxygens and twice as many hydrogens—for example, C3H6O3 or C5H10O5. The ending -ose indicates that you are dealing with a carbohydrate. Simple sugars are usually described by the number of carbons in the molecule. A triose has 3 carbons, a pentose has 5, and a hexose has 6. If you remember that the number of carbons equals the number of oxygen atoms and that the number of hydrogens is double that number, these names tell you the empirical formula for the simple sugar. Simple sugars, such as glucose, fructose, and galactose, provide the chemical energy necessary to keep organisms alive. Glucose, C6H12O6, is the most abundant simple sugar; it serves as a food and a basic building block for other carbohydrates. Glucose (also called dextrose) is found in the sap of plants; in the human bloodstream, it is called blood sugar. Corn syrup, which is often used as a sweetener, is mostly glucose. Fructose, as its name implies, is the sugar that occurs in fruits (fruit sugar), and you also see it on food labels as high fructose corn syrup. Glucose and fructose have the same empirical formula but have different structural formulas—that is, they are isomers (refer to figure 3.6). Honey is a mixture of glucose and fructose. This mixture of glucose and fructose is also formed when table sugar (sucrose) is reacted with water in the presence of an acid, a reaction that takes place in the preparation of canned fruit and candies. The mixture of glucose and fructose is called invert sugar. Thanks to fructose, invert sugar is about twice as sweet to the taste as the same amount of sucrose. Invert sugar also attracts water (is hygroscopic). 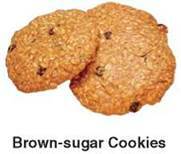 Brown sugar feels moister than white, granulated sugar because it contains more invert sugar. Therefore, baked goods made with brown sugar are moist and chewy. Cells can use simple sugars as building blocks of other more complex molecules such as the genetic material, DNA, and the important energy transfer molecule, ATP. DNA contains the simple sugar deoxyribose, and ATP contains the simple sugar ribose. Simple sugars can be combined with each other to form complex carbohydrates (figure 3.10). When two simple sugars bond to each other, a disaccharide (di = two) is formed; when three bond together, a trisaccharide (tri = three) is formed. Generally, a complex carbohydrate that is larger than this is called a polysaccharide (poly = many). For example, when glucose and fructose are joined together, they form a disaccharide, with the loss of a water molecule (review figure 3.9). (a) In the dehydration synthesis reaction illustrated here, the two—OH groups line up next to each other, so that an—OH group can be broken from one of the molecules and an—H can be removed from the other. The H—and the—OH are then combined to form water, and the oxygen that remains acts as a connection between the two sugar molecules. (b) A hydrolysis reaction is the opposite of a dehydration synthesis reaction. Carefully compare the two. Three common complex carbohydrates are (a) cellulose (wood fibers), (b) amylose and amylopectin (plant starches), and (c) glycogen (sometimes called animal starch). Glycogen is found in muscle cells. Notice how all are similar in that they are all polymers of simple sugars, but they differ in how they are joined together. Although many organisms are capable of digesting (hydrolyzing) the bonds that are found in glycogen and plant starch molecules, few are able to break those that link the monosaccharides of cellulose. Sucrose (table sugar) is the most common disaccharide. Sucrose occurs in high concentrations in sugarcane and sugar beets. It is extracted by crushing the plant materials, then dissolving the sucrose with water. The water is evaporated and the crystallized sugar is decolorized with charcoal to produce white sugar. Other common disaccharides are lactose (milk sugar) and maltose (malt sugar). All three of these disaccharides have similar properties, but maltose tastes only about one-third as sweet as sucrose. 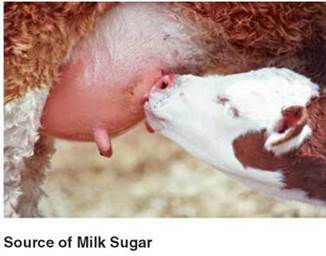 Lactose tastes only about one-sixth as sweet as sucrose (Table 3.1). All the complex carbohydrates are polysaccharides and formed by dehydration synthesis reactions. Some common examples of polysaccharides are starch and glycogen. Cellulose is an important polysaccharide used in constructing the cell walls of plant cells. Humans cannot digest (hydrolyze) this complex carbohydrate, so we are not able to use it as an energy source. On the other hand, animals known as ruminants (e.g., cows and sheep) and termites have microorganisms within their digestive tracts that digest cellulose, making it an energy source for them. Plant cell walls add bulk or fiber to our diet, but no calories. Fiber is an important addition to the diet, because it helps control weight and reduces the risk of colon cancer. It also controls constipation and diarrhea, because these large, water-holding molecules make these conditions less of a problem. 6. Give two examples of simple sugars and two examples of complex sugars. 7. What are the primary characteristics used to identify a compound as a carbohydrate?